Chili peppers may have been used to make spicy beverages thousands of years ago in Mexico, according to new research published November 13 in the open-access journal PLOS ONE by Terry Powis at Kennesaw State University and colleagues from other institutions. Capsicum species are usually referred to as chili peppers, and their uses are well known in the history of Spain and Portugal. There are relatively few sites in Mesoamerica, Central America, and South America that contain remains of Capsicum, and therefore, we know little about how groups such as the Mayans and the Mixe-Zoquean, inhabitants of the site studied here, used chili peppers in those regions. 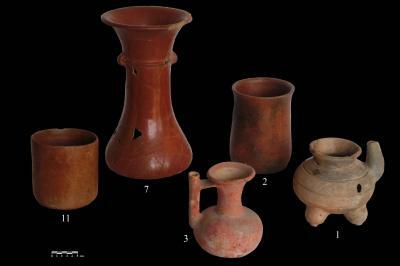 In this study, the authors used chemical extractions to reveal the presence of Capsicum residues in pottery samples from a site in southern Mexico. Some of these pottery vessels were over 2000 years old, dating from 400 BC to 300 AD. They found Capsicum residue in multiple types of jars and vessels, which suggests that those cultures may have been using chili peppers for many different culinary purposes. For instance, Capsicumwas found in a vessel called a sprouted jar, which is used for pouring a liquid into another container. The authors suggest that chili peppers may have been used to prepare spicy beverages or dining condiments. Powis elaborates, "The significance of our study is that it is the first of its kind to detect ancient chili pepper residues from early Mixe-Zoquean pottery in Mexico. While our findings ofCapsicum species in these Preclassic pots provides the earliest evidence of chili consumption in well-dated Mesoamerican archaeological contexts, we believe our scientific study opens the door for further collaborative research into how the pepper may have been used either from a culinary, pharmaceutical, or ritual perspective during the last few centuries before the time of Christ."